With Zoom integration, you can provide dial-in numbers for multiple different countries. When you set up your Zoom account, you can choose one or more countries that you commonly invite attendees from. The dial-in numbers for the countries that you choose appear by default in ScheduleOnce User notifications, Customer notifications, and the calendar invitation. 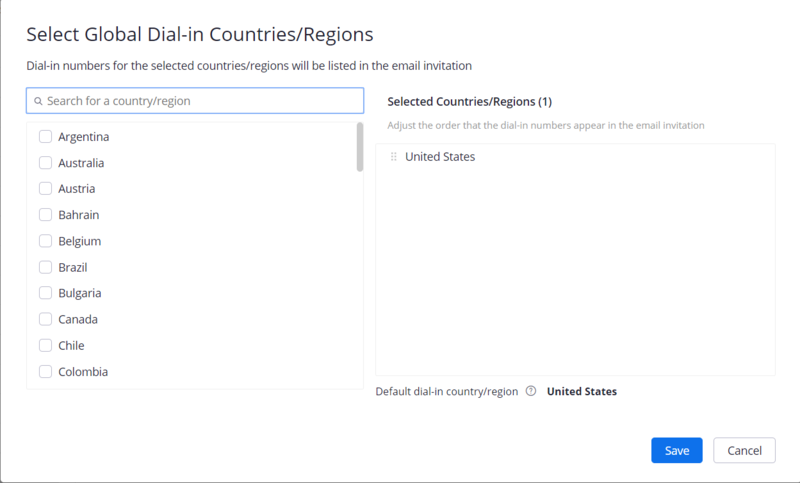 If you're an administrator, and want to specify a default set of countries for all meetings in your organization, click Account Settings and select the Telephone tab. If you're an administrator, and want to specify a default set of countries for a specific group, click Group Management, click the name of the group, and then click Group Settings. From here, select the Telephone tab. Scroll to the Global Dial-in Countries/Regions section of the page, then click the edit icon. The Select Global Dial-in Countries/Regions pop-up will appear (Figure 1). For example, if your meetings will have participants from the United States, Canada, and Australia, click the check boxes next to those country names. The selected dial-in numbers will appear in ScheduleOnce User notifications, Customer notifications, and the calendar invitation of any meetings scheduled via the connected Booking page.